In 1982 I discovered lace making. I had recently finished college (I was 18 years old) and hadn't shown any interest in crafting as such, though I had a friend who was particularly talented with her sewing and I was inspired to create bags and cushions etc like she did but I did not have a machine so sewed slowly by hand! During that time I saw a night class for Honiton Lace Making and I went along and it soon awakened the need to create and make (sewing, knitting, patchwork, crochet,embroidery,cross-stitch) - something that I have to do on a daily basis. I started with Honiton lace. This lace is made on a roundish pillow. 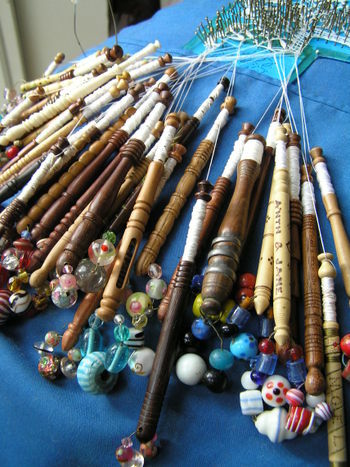 The husband of the lady who taught us made the most beautiful bobbins. He hand painted each bobbin with your name and the date. I can't remember how much they cost (it can't have been much as I was a poor ex-student!) and now I am kicking myself for not buying more as they were exquisite as you can see. The size of the bobbin is about 6cm - so small for such detail. I made a small leaf and a flower (of course!) which I subsequently gave to my mother. I moved to London and joined another class. This time I learnt Torchon lace. I much prefer this type of lace making because the bobbins that one uses for this type are, in my opinion, much more interesting. They have beads, called spangles, attached by wire to the end of the bobbin to give it a bit of weight to keep the threads taunt. I discovered that you could buy/find old bobbins made of bone that had names, proverbs and messages of love engraved upon them. So there started my first collection! I enjoyed making this type of lace as it was less fine and grew a bit quicker! Soon after I started Torchon lace I was desperate to start Bucks point lace but I had met my darling Anth by then, had gotten married and was living in New Zealand, along way from English lace. Whilst living there I joined the NZ Lacemakers Guild (I think that is what it was called) and met with fellow lacemakers and continued to make lace, though this wasn't a class as such, it was lovely to sit and chat and look at each others work. When we came back to Britain I had already discovered knitting and patchwork and could only find a class that did Honiton lace (it was the Devon link!) so unfortunately my lace has been put to one side for many years. I brought it down from the attic to show the children the other day and thought I would take some pictures to share with you. I think the reason that I have not picked it up again is that I can't think of what to do with the lace when I finish it. It is so fine and there are only so many lace edged hankies a girl can have! I still look out for bobbins. I just adore the look of them and the history behind each one. Take a look at this...aren't they lovely? 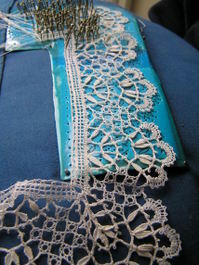 Here are my lace pillows - one has an unfinished bookmark on it. The other is a hankerchief edging. I might one day finish them - who knows!